In a San Diego, California neighborhood, debate is raging: The Department of Veterans Affairs is planning to establish a residential treatment program for Veterans with PTSD and mild traumatic brain injuries. Without saying as much, this is an example where some in a community are simply not comfortable with what they view as damaged and potentially unstable Veterans being near a school. Of course, this attitude doesn’t take place in a vacuum, and it wasn’t formed recently. There is a reason people have such views of those who once protected them. While these stories highlight horrific killings, the connection between disturbed murderers like Benjamin Barnes and Itzcoatl Ocampo and their service in combat is weak—despite what media reports and popular culture would have many believe. And such rhetoric, when solidified in the public consciousness, can have negative consequences for both Veterans and society—like causing Veterans to avoid seeking help or employers to avoid hiring them. For the past two years, Blake has worked with Veterans who have PTSD in the residential trauma recovery program and the women’s mental health clinic at the Baltimore VA Medical Center. He doesn’t shy away from the obvious—that combat and wartime experience can have mental health consequences—which can contribute to some Vets acting out. But he throws caution to the idea that this is an epidemic. In a 2007 report on Veterans in state and federal prison—the most current report of its kind—researchers at theBureau of Justice Statistics worked to demystify the vagaries surrounding Veterans and crime. As it turned out, during the past three decades, the number of Veterans in state and federal prison had actually declined. 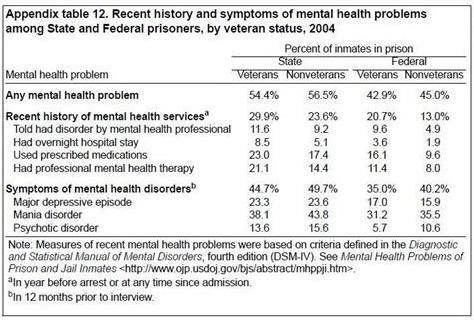 And when the mental health of Veterans in prison was compared to that of their civilian counterparts, there seemed to be a trend: Civilians reported a higher rate of “any mental health problems” than Veterans—both in state and federal prison. When it came to psychotic disorder, which represents the more extreme end of the spectrum of mental health problems, the rates remained higher among civilians as well. When the survey was conducted in 2004, the Veteran population in the U.S. was 24 million. America’s prisons were home to 140,000 Vets—of which 21,000 had been convicted of murder. And while those numbers seem large, this accounts for less than 1/10 of one percent of the entire Veteran population. A far cry from what some in the media would lead us to believe. While a small fraction of Veterans have been convicted of murder, it often matters little in a media atmosphere which can place a premium on sensational headlines. In such an environment, Veterans are often stereotyped by those with an unclear understanding of what it means to live with PTSD. And the fact is, there is no limit to the number of reasons why a person might choose to become violent. According to Gerhard Falk’s Murder: An Analysis of Its Forms, Conditions, and Causes, the occupations most likely to include murderers are laborers, service workers, and students. A comparison of those findings with the FBI’s Most Wanted list for violent crimes in 2012 shows a similar occurrence of occupations. Overwhelmingly, the top three offenders by occupation are general laborers, construction workers, and gang members. Of course, we rarely—if ever—see articles hinting at a larger problem within the laborer field or the construction field. Likely, this is because we inherently understand that occupation or work experience doesn’t typically factor into a propensity for murder. Then again, headlines that scream, “Man Yielding Concrete Mix Charged with Murder: Hint of a Larger Problem?” are likely not as profitable. Unfortunately, this rehashed portrayal of PTSD, reminiscent of the Vietnam era, has the power to deter Veterans from openly speaking about their service—especially in today’s economic climate—when unemployment among younger Vets hovers between 20 and 30 percent. That concerns Iraq Veteran Ryan Gallucci, now with the Veterans of Foreign Wars. 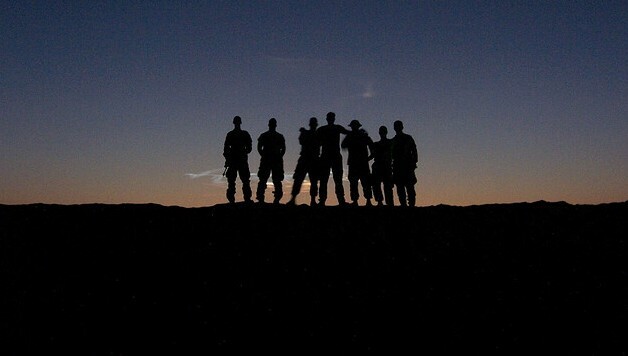 Blackouts, flashbacks, night terrors, and sudden rages are common among veterans; suicide, alcoholism, and drug use have surged. PTSD has been cited as a factor in many acts of vets running amok. . .
As long as such language remains prevalent and acceptable, college admission offices, future employers, and those alike can peg today’s Veterans as “running amok” with the tendency to burst into “sudden rages”—quietly widening the divide further between Veterans and civilians. In fiscal year 2011, over 476,000 Veterans received treatment at VA medical centers and clinics across the country for PTSD. Of those, 99,000 were Iraq and Afghanistan Veterans. Dr. Batten expects more Vets to seek treatment in the coming years. While the country has slowly begun to recognize post-traumatic stress—from “soldier’s heart” to “shell shock” to “combat fatigue”—there are still barriers preventing Veterans from seeking help. According to one survey of OEF/OIF Veterans, there is still legitimate concern over asking for care. With imbalanced portrayals of PTSD, these ideas will continue to fuel misunderstandings like the type seen in San Diego. But we have the leverage to change this—to make a conscious decision to understand what it means to live with PTSD. And to give those who have served a fair shot by stripping away those unwarranted stereotypes and seeing Veterans for who they really are. If you feel you might be struggling with post-traumatic stress, visit our PTSD resource directory for information on symptoms, treatments, issues specific to female Veterans, and more. For immediate help, call the Veterans Crisis Line at 1-800-273-8255. It’s open day and night, along with our online chat. If you prefer text messaging, send a message to 838255. Text of Kucinich-Roe "Dear Colleague"